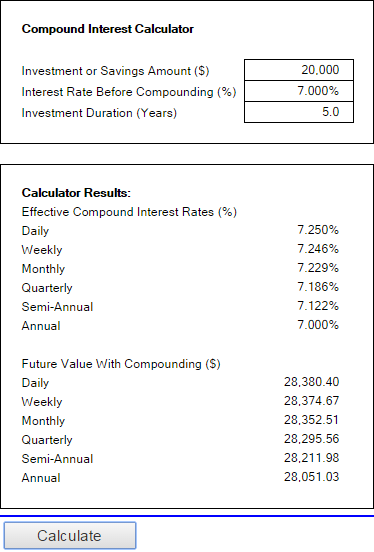 The tutorial explains the compound interest formula for Excel and provides examples of how to calculate the future value of the investment at annual, monthly or daily compounding interest rate. You will also find the detailed steps to create your own Excel compound interest calculator. Compound interest is one of the basic building blocks in banking and one of the most powerful financial forces around that determine the outcome of your investments. Unless you are an accounting graduate, financial analyst or an experienced investor, it might be a bit difficult to grasp the concept from specialized financial books and manuals. The aim of this article is to make it easy : ) You will also learn how to use a compound interest formula in Excel and create a universal compound interest calculator for your own worksheets. It might be easier to start with simple interest that is calculated only on the principal amount. For example, you put $10 into a bank account. How much will your deposit be worth in one year at an annual interest rate of 7%? The answer is $10.7, and your earned interest is $0.70. In case of compound interest, the principal in each time period is different. The bank won't give the earned interest back to you, instead they add it to your principle investment. This increased amount becomes the principal for the next time period (compounding period) and also earns interest. In other words, you earn interest not only on the principal amount, but also on the interest earned in each compounding period. In our example, in addition to the principle amount of $10, the earned interest of $0.70 will also earn interest next year. So, how much will your $10 deposit be worth after 2 years at the annual interest rate of 7%? The answer is $11.45 and you can calculate it in several ways, as demonstrated below. Long time investments can be an effective strategy to increase your wealth, and even small deposits can make a big difference over time. The Excel compound interest formulas explained further will help you get the savings strategy to work. Eventually, we are going to make a universal formula that calculates the future value of the investment at any of the compounding interest rates - daily, weekly, monthly, quarterly, or annual. 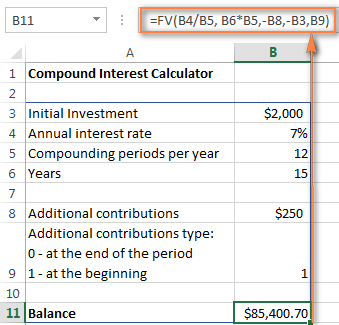 To understand the idea of compound interest better, let's begin with a very simple example discussed at the beginning of this tutorial and write a formula to calculate annual compound interest in Excel. As you remember, you are investing $10 at the annual interest rate of 7% and want to know how yearly compounding increases your savings. An easy and straightforward way to calculate the amount earned with an annual compound interest is using the formula to increase a number by percentage: =Amount * (1 + %). 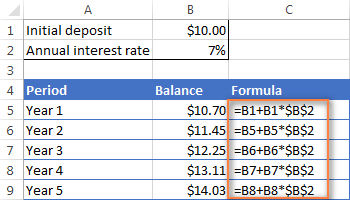 In our example, the formula is =A2*(1+$B2) where A2 is your initial deposit and B2 is the annual interest rate. Please pay attention that we fix the reference to column B by using the $ sign. As you remember, 1% is one part of a hundred, i.e. 0.01, so 7% is 0.07, and this is how percentages are actually stored in Excel. Keeping this in mind, you can verify the result returned by the formula by performing a simple calculation of 10*(1+0.07) or 10*1.07 and make sure that your balance after 1 year will be $10.70 indeed. And now, let's calculate the balance after 2 years. So, how much will your $10 deposit be worth in two years' time at an annual interest rate of 7%? The answer is $11.45 and you can get it by copying the same formula to column D.
To calculate how much money you will find in your bank account at the end of 3 years, simply copy the same formula to column E and you will get $12.25. Another way to make an annual compound interest formula is to calculate the earned interest for each year and then add it to the initial deposit. 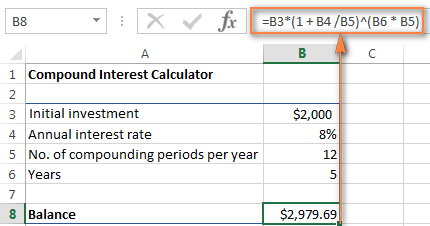 Fix the reference to the Annual Interest Rate cell (B2 in our case) by adding the $ sign, it should be an absolute column and absolute row, like $B$2. In this example, you'd enter the formula =B5 + B5 * $B$2 in cell B6 and then copy it down to other rows, like demonstrated in the screenshot below. To find out how much interest you actually earned with annual compound interest, enter the formula =B5-B1 (Balance after 1 year - Initial deposit) in cell C5. Then enter =B6-B5 (Balance after 2 years - Balance after 1 year) in cell C6 and drag the formula down to other cells. You should see the earned interest's growth like in the screenshot below that reveals the real power of compound interest. The above examples do a good job illustrating the idea of compound interest, don't they? But none of the formulas is good enough to be called a universal compound interest formula for Excel. Firstly, because they do not let you specify a compounding period, and secondly, because you have to build an entire table rather than simply enter a certain duration and interest rate. Well, let's take a step forward and create a universal compound interest formula for Excel that can calculate how much money you will earn with yearly, quarterly, monthly, weekly or daily compounding. To illustrate the point better, here are a couple of quick examples. Suppose, you invest $2,000 at 8% interest rate compounded monthly and you want to know the value of your investment after 5 years. As you see, with daily compounding interest, the future value of the same investment is a bit higher than with monthly compounding. This is because the 8% interest rate adds interest to the principal amount each day rather than each month. As you can guess, the monthly compounding result will be higher than annual compounding. All this is good, but what you really want is an Excel formula for compound interest, right? Just bear with me for a little longer, please. Now we are getting to the most interesting part - building your own powerful and versatile compound interest calculator in Excel. 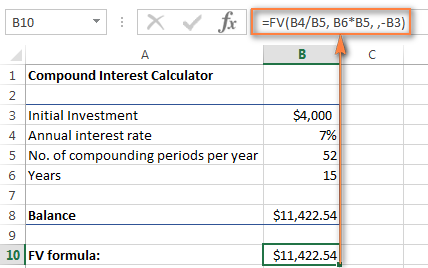 Usually, there is more than one way to do something in Excel and a compound interest formula is not an exception :) Although Microsoft Excel provides no special function for calculating compound interest, you can use other functions to create your own compound interest calculator. All you need now is the compound interest formula to calculate the earned amount (Balance) based on the input values. The best news is that you don't have to re-invent the wheel. We will simply take the time-tested compound interest formula used by banking and other financial institutions and slightly modify its expressions so that Excel can understand it. The numbers look rather familiar? Yep, these are the same values and calculations that we've performed with a monthly compound interest formula, and the result proves that we did everything right! To calculate the future value of your investment with semi-annual compounding, enter 2 as the Compounding periods per year value. For weekly interest rates, enter 52, this is how many weeks each year contains. If you are interested in daily compounding, enter 365, and so on. And now, it's time to use this formula in your Excel spreadsheets, or you can download the compound interest calculator we've just created. If for some reason you are not quite happy with the compound interest formula discussed above, you can create your Excel compound interest calculator with the Future Value function that is available in Microsoft Excel 2013, 2010, 2007, 2003 and 2000. In the function, the first 3 arguments are obligatory and the last 2 are optional. rate - an interest rate per period, exactly as the argument's name suggests. nper - the number of payment periods. pmt - an additional payment that is made each period, represented as a negative number. If the pmt argument is omitted, the pv parameter must be included. pv (optional) - the present value of the investment (principle investment), which is also a negative number. If the pv argument is omitted, it is assumed to be zero (0), in this case the pmt parameter must be specified. type (optional) - specifies when additional payments are due: 0 or omitted - at the end of the period, and 1 - at the beginning of the period. Let's use Excel FV formula with the same values as in monthly compound interest examples and see whether we get the same result. rate - 0.008/12 since you have the 8% annual interest rate compounded monthly. pmt is left blank because our task does not involve additional payments to the principle investment of $2,000. pv is -2000 since the syntax of the FV function requires using a negative number in this argument. 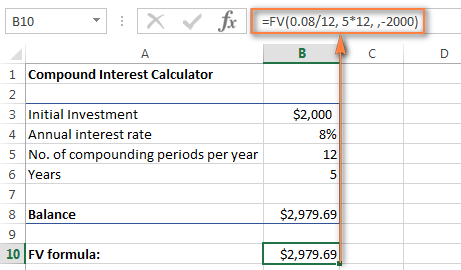 As demonstrated in the following screenshot, the FV formula returns the same result as the compound interest calculator that we created in the previous example. To make your Excel compound interest calculator even more powerful, you can extend it with the Additional contributions option (additional payments) and modify the compound interest formula accordingly. B9 - additional contributions type. Remember that you enter 1 if you deposit an additional amount at the beginning of the compounding period, 0 or omitted if additional payments are made at the end of the period. If you are curious to try this advanced compound interest calculator for Excel to compute your savings, feel free to download it. If you prefer investing money rather than time in figuring out how to calculate compound interest in Excel, online compound interest calculators may come in handy. You can find plenty of them by entering something like "compound interest calculator" in your preferred search engine. In the meantime, let me quickly present a couple of my favorite ones. Clicking the View Report button generates a "Summary Report" as well as "Savings Balance" that provides the detailed info on the amount of additional contributions, earned interest and balance for each year. 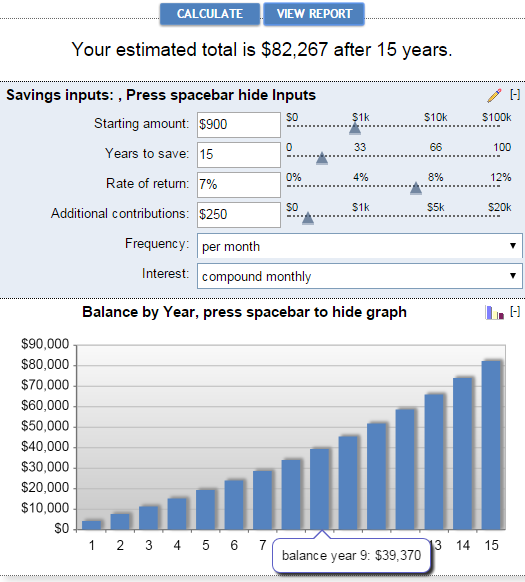 The online calculator from Money-Zine is much simpler compared to Bankrate's one. It asks you to specify only 3 values: the principle investment, interest rate and duration. As soon as you supply these numbers and click the Calculate button, it will show you all types of compound interest rate (daily, weekly, monthly, annual, etc.) as well as the future values with a corresponding compounding. 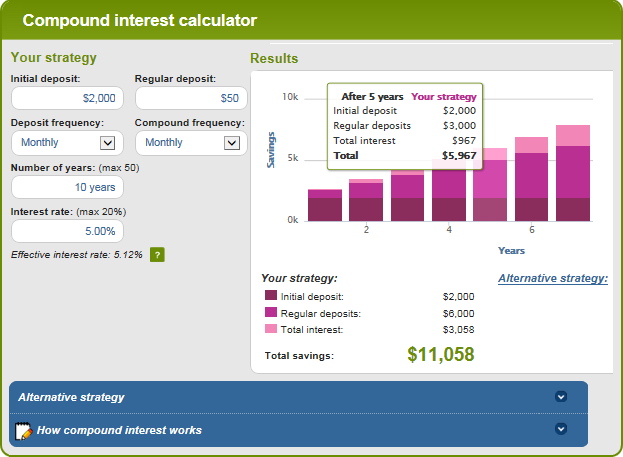 This is a really nice online compound interest calculator run by Australian Securities and Investments Commission. It lets you input all relevant factors that determine the future value of your investment and outputs the result as a graph. By hovering over a certain bar in the graph, you can see the summary info for that particular year. 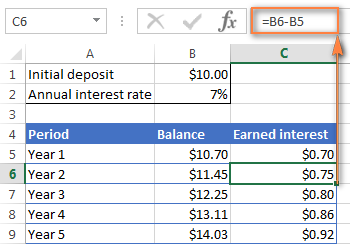 This is how you calculate compound interest in Excel and outside it :) I hope at least one compound interest formula discussed in this article has proved helpful to you. Anyway, I thank you for reading and hope to see you on our blog next week! 80 Responses to "How to calculate compound interest in Excel - formula for daily, monthly, yearly compounding"
amount $5000 invested for 1 year. Interest compounded quarterly. Interest amount $449.40. Principal amount + Interest amount is $5449.40. please explain this with formula. And what is the interest rate (%)? Thank you so much for your kind words, Naveed! Can this be done? Can there be a schedule too? I have been searching the internet high and low and cannot find anyone who has this. if you multiply the monthly contribution type by 12 that will give you additional monthly. (ie. from example above =FV(B4/B5, B6*B5, (-B8*12), -B3, B9). Not sure what you mean by 'Increase Deposit Annually by (Percentage) but if this is considered a rollover where 0 dividends are paid to you, the next year's starting principal will be the previous years Future value. You would have create your own schedule and every year after the FV has been determined consider this your next years principal balance. question. 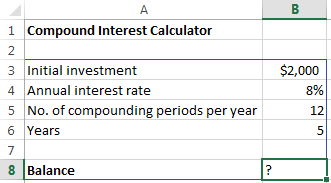 trying to calculate interest for 1 year assuming 27 periods where the first period earns the full rate of interest 10%, each period decreases the amount of interest by 2/27 the last period earns 1/27 of the full amount of interest. Trying to get an excel formula. I would appreciate ant help as soon as possible,. TMC tu bhi guju ke udhar he job kar ta hai and uski he roti khata hai. yad rakh guju nahi tere khane tak ke wandhe ho jaye ge MC. Can you help me devise a formulae to reduced monthly interest charged against a loan as additional funds were added to Initial loan. It is complication of using some housing funds as a general account. how we calculate compund intrest for momthly.show me all the monthly calculation for this. I have been unable to find such a calculator on the Internet, as all the formulas do not allow for annual donation changes by donation percentage, as I have stated above. I suspect that Kailua was seeking a similar formula. In summary, I am planning to see what the final savings amount will be if I advise my grandchild to contribute $100 per month to his investment portfolio (i.e. $1200 in Year 1), and assume a 7% annual return; and increase his monthly contribution by 3% each successive year (i.e. $103 per month in Year 2) until he retires at age 65. Let's say i want to save 1000 000,i want it in 5 years time and the interest rate is 11%. What formula can i use to work out the monthly amount to save in order to get to 1000 000 in 5 years. Hello, is there an excel function that will be able to predict values for 25 years with an escalation rate of X% and frequency of every n years. For example: Lease rate at the moment is $200 with an escalation of 3% every 3 years. Is is possible to have a formula that will auto-compute annual values? Please clarify what you mean by escalation of 3% every 3 years. compute the present value of an $1,850 payment made in 8 years when the discount rate is 10%. Hi! I do have a question, I don't know if this is complicated or not. How can I create a table that responds to the number of years as an input for the compound interest? Example: What is the New Principal Amount in 4 years where there should be 4 rows that would show what the new principal is going to be in that particular year. For us to be able to assist you better, please send us a small sample table with your data in excel to suppot@ablebits.com. Principal: $200,000, Annual Interest Rate: 5%, Loan Period: 25 years, Payments being made monthly. Using Excel's PPMT formula I calculated a Monthly Repayment of $1,169.18 =-PMT(5/12,25*12,200000). What I want to do now is to calculate the number of repayments if I increase the calculated monthly Repayment by a constant amount, say $50.00 per month. I tried using Excel's NPER and I tested it using the same inputs from above. NPER(rate,pmt,pv,[fv],[type])or NPER(5/12,1169.18,200000,0). This gave me a result of 129.41 whereas I was expecting 25years X 12 = 300months. So unless I have erred then NPER is not what I want. At this point I started trying to transpose the Compound Interest formula with little luck. "How do I calculate the Term of a loan when the Monthly Repayment Value, The Annual Interest Rate and the Original Loan Amount are all known?" I want to know the formula for the following calculation. I was wondering if anyone could help me with this problem. 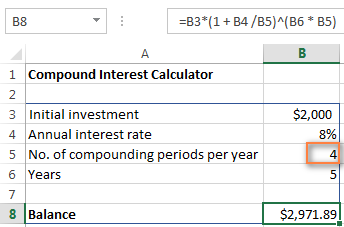 I'm trying to calculate the future value of a 1 year investment using excel but I am having issues because I have two differing semiannual interest rates. In my case, I would like to know the compound interest. For example, every month I am paying a particular amount for 20 months. I have the future value. So is there a way to know the compound the interest? What will be the Compound interest? I need to calculate the accumulated interest on a loan between two dates. Interest rate is 5.2% calculated monthly but there have been no payments. $1,000	9-Nov-15 10-Mar-16	5.20%	Monthly	? $5,000	26-Nov-15 10-Mar-16	5.20%	Monthly	? $6,700	1-Dec-15 10-Mar-16	5.20%	Monthly	? I have a client that experienced embezzlement from a former employee. How can I calculate interest on the money he embezzled? Can I continue to add new amounts as they happen and continue to calculate interest on the entire amount. Time period of theft 2011-2014. Money has not been recovered so I want to continue to calculate interest. The loss of money did impact the business. Business could not complete planned renovations that cost the business additional sales. How do I amend the formula such that interest is calculated not with reference to the quarters BUT with reference to the annual quarter days found in many leases namely: 25 March, 24 June, 29 September and 25 December annually? I want to build a tool to calculate required monthly instalments, when interest rate is fixed, future value is known/changeable, duration is known/ changeable and interest is compound daily. Can anyone tell me how to calculate the interest that i am paying if: I have an amount of principal that i am paying interest on and the amount increases every period and i know what the total amount of interest i am paying at the end is? interest? Example. The interest earned by a principal invested 5% compound anually for 3years is computed using the relation c=Prt, where c is the interest, P is the principal, r is the rate, and t is the time. I just wanted to say a BIG Thank You for creating this "learn-and-do-it-yourself" website. Now the total principal is 548767. the interest must calculate on this figure. and if repay the the loan first settled capitalized interest, then remaining interest and then principal. Now it's 400 days running. If The loan amount partially with 100000.
then settled accrued interest i.e. 21000, then remaining amount to be deducted on Principal. after that principal amount will be 469676 and interest will be calculated on it. Assume: (yearly gross revenue): 32,964,000 will not increase over the 20-year period. Questions: 1)compute the payout(payback) point for undiscounted cash. 2) compute the payout(payback) point for discounted (time value) cash. I am trying to calculate the amount owing on a loan of $6,600 taken out 1/01/1990 which went for 2.5 years (no interest was paid), and then $4,150 was paid back but the remaining $2,450 still outstanding. Interest calculated daily (as per bank loan). I have looked up the bank interest rates for the period so can use a pivot table but would like the formula to calculate what is still owed. I am trying to work out what the monthly payments would be on a loan with compound interest. I am able work out the compound value at the end of the term using FVSCHEDULE, but how do I work out what how the monthly payments will impact this? I'm trying to find the annual return for a string of 12 monthly returns, any chance someone knows what the formula would be? When adding them up it ends up being 6.21% but I know there's a more accurate way. Can someone please help? Never saw an answer to Richards question (Ref. #9) Please respond to it, email me the answer. I am also trying to see the answer to help my Son! Do large financial institutions/banks use 365.25 for annual rates (do to leap years)? Thank you for this post. Can you please tell me the formula in excel to calculate n (years) if the amount, rate and principal is known. how can calculate the compound interest rate ??? Excel is one of those tool-case programs that is indeed useful for everyone - in the same way that 1-2-3 originally was. It's not that Office (as a whole) isn't useful - it is; it's just that it gets taken for granted. How many of you use Office (not just Word or even Excel) for non-work-related things at home on a weekly basis? Gaining the same interest every 45 days effective February 18, 2015 to current date. Gaining the same interest every 90 days effective February 18, 2015 to current date. I found this site very helpful until I found an error in the way you work with the FV function. I cross referenced the ASIC calculator with your formula and your excell formula was only working when the number of compounding periods equals exactly 12. As soon as you change this figure it becomes very inaccurate. This is because in your formula the contributions are only made the same number of times that interest is compounded. Ie. when you set pmt to $250 and compounding periods as 12, then it adds the $250 12 times, when you set pmt to $250 and number of compounding periods to 1 then it is mistakenly only adding the $250 once instead of 12 times. 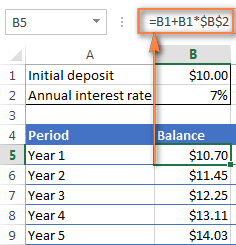 Hi Svetlana, can you help with a formula (for Excel) to "reverse engineer" compound interest. I have an investment that compounds weekly, but at no set rate (trading currencies, some weeks are better than others). I want to work out each week, what the effective compound interest rate has been since starting the investment, and then use that rate to work out a "what if" scenario..... what if this investment continues to perform at the current level till the end of the financial year? So, I want to enter the Initial Value, Current Value, Number of Periods since start, and it should give me the "effective weekly compound interest rate". Suppose you invest Rs.10000 in a business each December 31 (at the end of each year) for the next 10 years. If you are getting interest of 12%, compounded semiannually, how much will you have after 10 years? invest Rs.10000 in a business each December 31 (at the end of each year) for the next 10 years? 5.Suppose John could change investment plans at E-Trade and earn an additional 1% per annum beginning in year 2 and an additional 1% beginning in year 4. How much money do they need to save each month to reach their goal? What if I need to find the future value when it has a monthly investment? EX: Inital Investment $8000 , Monthly Investment $125, Rate 8.75, and 20 years. 1) I have 200,000 and it will be double in 10 years time. What compound interest rate would be required? Solution in excel please. 2) PV of cash out flow for 48 months @ 1500 per month paid at the beginning of each month. Solution in excel please. Brilliant. Thanks a lot, exactly what I needed. The best, quicker and easier, option would be a macro or VBA code. You can ask around Mr. Excel forum for them. Fantastic! Thank u so much for the formula and tip. Wishising u all the best. be changed so that if the end of the month falls on a weekend then it gives the date of the last working business day. Then rule continues as before. Also how can your 1st formula and your 2nd formula above be rewritten so rather than 7 day increments, how can I change the interval date to any number so that it still follows the above two formula rules. But when you want to use both, incremental number and weekend rule, the formula becomes too complex and long. You need to use a VBA code or a macro. I have to create a spreadsheet of a principal amount owing, compounded daily, at interest rates that change every 3 months, with occasional payments to reduce principal, over a period of 8 years. Can you help me with my formula? I have a list of the various interest rates. What is the compound interest of any amount invested at 6%, if the interest is capitalized quarterly? I have a loan for 25,000 at 7% interest with a total payback of 32,250 this loan is paid back on a daily basis for 12 months except for holidays and weekends. The total number of payments are 252. The daily payment is 128.00. How do I do an amortization table? I need to find out what is currently owed on a past due debt that is incurring interest. I have several debts owed to me that I need to track. For example, one debt from July 01, 2015 with a principle of $267.27 that is accruing interest of 12% per annum. from August 01, 2015 through today's date. A second debt from August 01, 2015 with a principle of $623.12 that is accruing interest of 12% per annum. through today's date. A third debt from January 01, 2017 with a principle of $6500 and an interest rate of 18% through today's date. I need an excel spreadsheet that can show the court the amount currently owed on each debt seperatly and how that amount has grown. I am trying to use the Excel FV to calculate the compound interest of a series of annual payments, compounded quarterly. I can divide the annual interest rate by 4 and multiply the terms to num of years * 4. This does not give the same as done long way in Excel. The long way is calculate quarterly compounded interest each year and then add annual payment. This is compounded the next year and so forth. Is this possible to be done using Excel functions? Hi Maria, I was just wondering if one can calculate compound interest at a certain interest rate, compounded quarterly, but with the additional payment being every month and not every quarter. Any help would be appreciated! I like to know the excel formula for fixed deposit which compounding in certain period when entry and exit dates are provided. Example: I have deposited $.2,000 on 11th Oct 2018 @ annual rate of 10% with quarterly compounding. What will be my future value on 8th Sept 2019. We can get the future value as $.2,188.75 at end of period as worked out below. Can any body help me in this task. I have a loan that I will make monthly payment,but interest compound daily. How can I show it in Excel? I am trying to calculate interest on back pay. The interest is compounded daily and there is new principle added every two weeks (not to mention the interest rate changed over the relevant period) is there a formula for this? For example, employee A was supposed to be paid $2000 every two weeks, he is due back pay with 4% interest compounded daily for say 6 months. How would I calculate this?